Nobody likes to make mistakes, feel pain or experience failure. But that’s how we learn, grow and succeed. It’s something we’re losing today. A 2004 article in Psychology Today explores this phenomena, and if anything it seems more relevant today. The article bemoans the way parents over-protect their children, keeping them from experiencing the mistakes, pain and failure that will teach them important life lessons. Kids are coached through play and never learn how to skin their knee and get back up again. Parents swoop in to resolve every playground conflict and kids never learn to handle their own disputes. Parents fight with teachers, trying to gain every advantage for their child. In the end, kids learn how to work the system instead of how to overcome challenges. The article points to college as the time when the “emotional training wheels come off,” but now kids totter and crash. Relationship problems used to be the biggest issue for college students, a developmentally appropriate concern. But since 1996, anxiety has overtaken relationship woes. Now 15% of college students nationwide are depressed. Those relationship woes haven’t gone away, but worsened, with stalking on the rise. Anorexia and bulimia now effect 40% of women at some point in their college career. Binge drinking is a steadily growing problem. Yikes. College students don’t know how to cope. And in some ways colleges have caved. At one point 94% of seniors at Harvard were graduating with honors. It reminds me of one of the conflicts in the Pixar super-hero film The Incredibles: If everyone is special, then no one is special. It’s not just college students either. Adolescence has extended into the 30s. It’s a hard thing. Nobody wants to see their kids hurt. 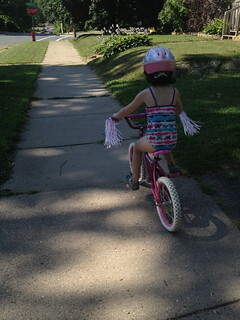 I think about teaching Lexi how to ride her bike last summer. Failure seemed to shut her down. But more than failure, the fear was the most crippling. Fear of falling down, certainly, but also the fear of failure more than the failure itself. I realized more than anything I had to teach Lexi how to get up and try again. I let her “crash” into the grass at one point, proving that she could dust her self off and try again. She almost didn’t. I’m hardly an over-protective parent. But even in a simple example like learning how to ride a bike I see these difficulties in coping with mistakes, pain and failure. Somehow, we need to learn to embrace them. Only then can we rise above them. “If you want to double your success rate you need to triple your failure rate.” That’s the mantra of an off-the-grid, quasi homeless character in Cory Doctorow’s Pirate Cinema who learns to maximize his panhandling to the point that he does it to help the truly homeless and destitute rather than himself. We can’t be so afraid of failure, because failure is what leads to success. You have to try, try and try again. As much as I hate to admit it, Yoda was wrong.